If It's Too Loud...: Tom Morello featuring Vic Mensa - "We Don't Need You"
Tom Morello featuring Vic Mensa - "We Don't Need You"
Tom Morello (Rage Against the Machine, Audioslave, Prophets of Rage) has been rocking a solo career for quite some time. This century, he's released solo albums under The Nightwatchman moniker as well as his own name. These have been mostly acoustic folk-rock albums filled for the most part with protest songs. In October he'll be releasing another solo album, but this one appears to be more of a rocker/possible party album. Based on the list of collaborators for the album, we're going to assume Morello takes a step back from vocal duties and takes over the guitar like we all want to. Right now you can listen to "We Don't Need You," his collaboration with rapper Vic Mensa. It gets fairly political with 9/11 conspiracies being spouted by Mensa, and it's way more of a banger than we're used to from Morello. In fact, his guitar almost sounds autotuned at some parts, if that is even possible. At the very least, the new album will be interesting. You can listen to "We Don't Need You" below. Tom Morello's new album, The Atlas Underground, will be out October 12 on Mom + Pop. It will also feature collaborations with Killer Mike, Big Boi, Portugal the Man, K Flay, Marcus Mumford, Gary Clark Jr., Steve Aoki, GZA, RZA, and more. You can pre-order a copy here. 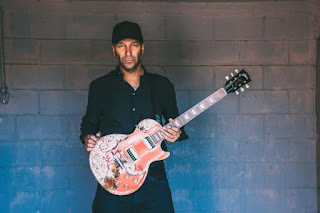 For more on Tom Morello, check out his website.